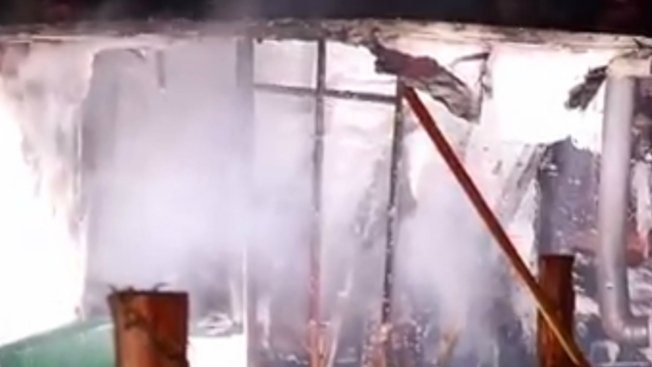 Firefighters dispatched to a mobile home fire in Exeter, Rhode Island, encountered an additional hazard after finding that ammunition inside the home was set off by the blaze. Crews responded to the fire at Split Rock Trailer Park on South County Trail just after 8 p.m. Thursday. They arrived to find flames jutting through the roof of the mobile home and loud popping noises that were later determined to be ammunition exploding. Chief David Chamberlain says two teens were inside the home when the fire started. The male occupant pushed a girl out of a window before safely escaping the mobile home himself. A wood stove was found burning at the time of the blaze, but the fire's cause is still under investigation. The trailer appears to be destroyed.